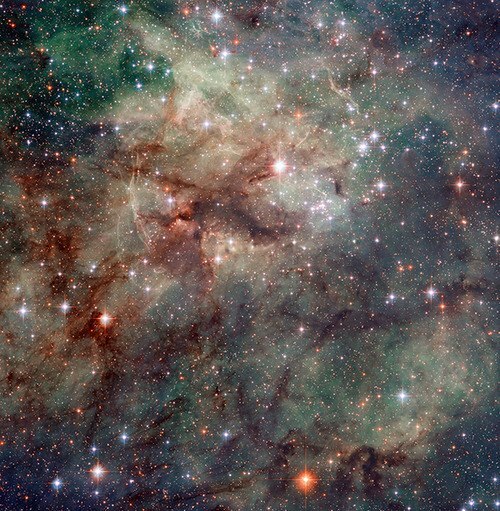 This is an up-close look at the Tarantula nebula (also known as 30 Doradus or NGC 2070): a large celestial region that is located more than 170,000 light-years away. It is most notable for the upward hike we’re seeing in the number of stars that are being churned out. Interestingly, this is one of the brightest, most energetic nebulae of its type in the immediate vicinity of our home galaxy (the nebula itself is located in the Large Magellanic Cloud; a neighboring galaxy of the Milky Way). It is so bright, in fact, that the nebula was thought to be a single star until the 18th century, when astronomer Nicolas Lacaille first discovered its intricate nebulous shape, thus uncovering its true form. It is also huge. The nebula stretches out more than 652 light-years in diameter (almost half the distance that separates our solar system and the Orion molecular cloud, which is some 1,344 light-years distant). Furthermore, if it were as close to our planet as the Orion nebula is, it would cast shadows on Earth, covering a full degree in the sky (or several lengths of the full moon). Also packed in this clustered area is the historic SN 1987 a — one of the most young supernova remnants seen in our galaxy since the 17th century (prior to the invention of the first telescopes). You can also see R136, a cluster of stars that hold the mass of 450,000 sun-like stars.